Here I am again! This last week has been pretty devoid of beading - a horrible thing for me - but I thought I would tell everyone a little bit about my new beaded bangles that I am offering for sale on Etsy. I am so proud of these!! I have seen many different designs for bangles that include an armature of some kind, such as a rubber cord (Marcia DeCoster) and brass rings (Lisa Kan), and some that are completely beadwoven...but I don't think any of them are made the way I made mine (I hope, anyway!) and I was extremely happy to have thought it up! 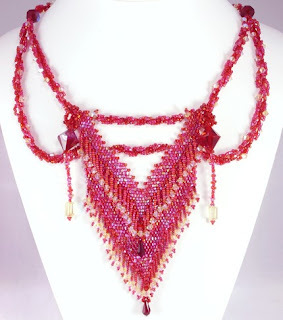 I started with two ropes of cubular right angle weave, stitched them together with a strip of right angle weave, finished the other side by adding another row of right angle weave, this time of beads AND swarovski crystals, then joined the ends, and VOILA! a beaded bangle that keeps its shape really well, and is flexible enough to slip over the hand without stretching out. (I used fireline for the whole project, which means people would really have to TRY to break it!!) I really enjoyed the process of creating it in my head first and thenn translating it into beads. Since I am sharing my technique - if not in detail - I ask that anyone who tries it out, please give me credit for the design in your description of your piece. I also decided that I would really like to include some of the members in my Etsy Beadweavers Team in my posts, so I am going to add in a few things here and there this year about their designs and shops. We have the most incredibly talented group of beadweavers EVER!! This week I would like to introduce those of you who aren't familiar with her, to Patricia at Silver Dragon on Etsy. This is just one of her lovely designs, I encourage you to follow the link above to her shop! I wish beady blessings to everyone, and hope that the coming week brings you everything you need! See you next Wednesday!! Hope you'll get more beadweaving done this week! Your bangle is fabulous! Thank you for showing work of other Team-mates. Good luck finding time for your beading!! All of the featured pieces are gorgeous. Your bangle is lovely but more than that is has strength and depth. 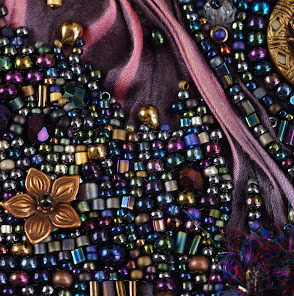 Keep on beading! Love your beautiful bangle, and your picks from Patricia and Linda as well. Great post! I think I'll try your bangle technique. I was looking for something new to try. I love your new design - and you showed off some lovely pieces from our friends! Ultimately, the decision to purchase replica omega watches online is your decision. If you're prepared to accept the actual risks louis vuitton monogram canvas .for your moment to be the envy of your buddies, then do it now! It is best to purchase a used genuine designer handbag than the usual replica cheap hermes handbags in the event that price is the main issue. You can conserve to purchase that brand new one from the rack cheap chanel handbags within the boutique or you can buy from somebody who has had sufficient of the cheap prada handbags that is only utilized twice as well as in perfect condition. The decision to purchase replica discount prada handbags is your decision. If you're prepared to accept the actual risks for your moment to be the envy of your buddies, then do it now! Learn more about - coco chanel online .